Sunday Blog Party - Christmas in July! 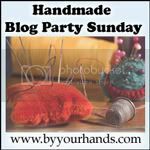 Welcome to our Sunday Blog Party. We would love to have you show us your handmade items for Christmas in July.